A luxuriously rich and creamy shampoo to gently cleanse and effectively remove product build-up without irritating the hair or scalp. Coconut, Jojoba and Olive Oils lightly condition so hair feels soft and silky, while Honey and ProVitamin encourage hair to retain moisture, helping to strengthen and improve shine. Silicone, SLES and SLS free. For best results massage into scalp and through damp hair. Leave for 20 minutes or overnight if preferred and rinse. Follow with Purifying Shampoo and Nourishing Conditioner. For best results massage into damp hair, creating a rich lather before rinsing. Follow with Nourishing Conditioner. 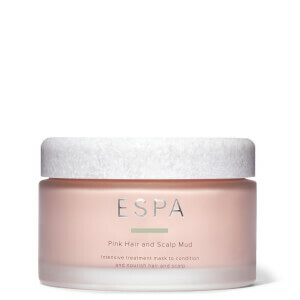 For an extra nourishing boost, apply Pink Hair and Scalp Mud to hair and leave on for 20 minutes before rinsing. For best results after washing your hair with Purifying Shampoo, follow with Nourishing Conditioner. Gently massage into damp hair and scalp, comb through and leave for two minutes before rinsing. For an extra nourishing boost, apply Pink Hair and Scalp Mud to hair and leave on for 20 minutes before rinsing. Water (Aqua), Sodium Lauryl Sulfoacetate, Propanediol, Cocamidopropyl Betaine, Caprylyl/Capryl Glucoside, Sodium Chloride, Glycerin, Sodium Lauroyl Sarcosinate, Hydroxypropyltrimonium Honey, Coco-Glucoside, Sodium Sulfate, Limonene, Panthenol, Xanthan Gum, Coconut Alcohol, Hydroxypropyl Guar Hydroxypropyltrimonium Chloride, Sodium Benzoate, Citrus Aurantium Dulcis (Orange) Peel Oil, Citrus Limon (Lemon) Peel Oil, Cupressus Sempervirens Oil, Citrus Aurantium Bergamia (Bergamot) Fruit Oil, Caprylic/Capric Triglyceride, Citrus Aurantifolia (Lime) Oil, Eucalyptus Globulus Leaf Oil, Lavandula Hybrida Oil, Potassium Sorbate, Linalool, Cocos Nucifera (Coconut) Oil, Olea Europaea (Olive) Fruit Oil, Simmondsia Chinensis (Jojoba) Seed Oil, Sodium Laurate, Abies Sibirica Oil, Mentha Arvensis Leaf Oil, Myristica Fragrans (Nutmeg) Kernel Oil, Zingiber Officinale (Ginger) Root Oil, Citric Acid, Sodium Hydroxide, Citral, Cupressus Sempervirens Leaf Oil, Cymbopogon Nardus (Citronella) Oil, Melaleuca Alternifolia (Tea Tree) Leaf Oil, Myrocarpus Fastigiatus Oil, Pogostemon Cablin Leaf Oil, Sodium Sarcosinate, Sorbic Acid, Cistus Ladaniferus Oil, Dipteryx Odorata Seed Extract, Ferula Galbaniflua (Galbanum) Resin Oil, Fucus Vesiculosus Extract, Jasminum Grandiflorum (Jasmine) Flower Extract, Lavandula Angustifolia (Lavender) Flower Extract. Delivery fast especially as it’s not charged for. Shampoo and conditioner fresh and leaves hair well conditioned and shiny. Hair mud a lovely overnight treatment for my hair and scalp, leaves hair in great condition. 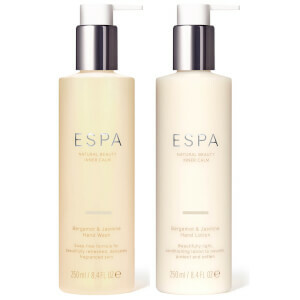 I have been impressed with all my Espa purchases from skin/body care to hair care. Pure spa luxury. 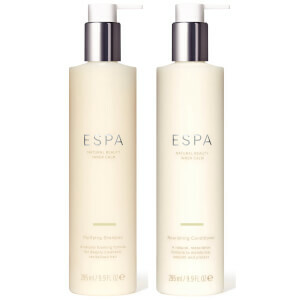 I have used Espa for many years but only recently, well last 9months been using the hair products. It took me a while to get use to the shampoo as there is not as much bubbles as normal shampoo but definitely worth it. My hair feel much softer, less dry and overall better condition- even my hairdresser noticed ! Although you may think they are expensive for hair products they last a good while. Only problem is the dispensers don’t always work well. Absolutely love these 3 products especially the pink hair and scalp mud. Leaves hair feeling and smelling incredible. I bought multiple of this trio as gifts so I was disappointed they weren’t presented in a better way as usually when I purchase in store I am always offered a box for the items. Bought this as had a sample when I stayed in a hotel. Absolutely love it and can honestly say my hair smells lovely even the following day.